Today is the day I’ve been telling you about for two weeks. The day we celebrate SALAD! It’s time to grab those tongs and toss up your best salad recipe. Why are we celebrating salad? Because the International Olive Council’s Add Some Life campaign would like to remind us that healthy eating does not need to be boring, bland and unsatisfying. By adding color with fruits, vegetables and heart-healthy olive oils, it’s easy to achieve a satisfying, nutrient-rich diet that’s as appealing to the eye as it is to the palate. Bright red tomatoes. Ripe olives of deep ebony. Vivid red and green peppers. An array of bold cheese varieties and crusty breads. Intensely green olives. The warm, golden hue of olive oil. Aesthetically — and nutritionally — healthy eating is a thing of beauty. My salad is bright and bursting with flavor from cucumbers, Garlic Basil Cherry tomatoes, feta cheese and my favorite, kalamata olives, marinated in a Homemade Honey Dill Vinaigrette. It’s one of those salads you crave as the weather starts to warm up, especially if you’re tired of leafy salads that just don’t seem to fill you up. It makes for a beautiful and tasty lunch, but it also makes a great dinner when topped with a piece of grilled chicken . Leftovers, if you have any, will stay good in the fridge for several days. I’m planning to make a big batch to keep in the fridge to eat on all week. oh, and this would make a GREAT dish to take to a summer BBQ or picnic! Much more fun and flavorful than potato salad or coleslaw. This Cucumber, Tomato, Feta & Olive salad would surely steal the show! Add feta cheese and serve over a bed of greens. 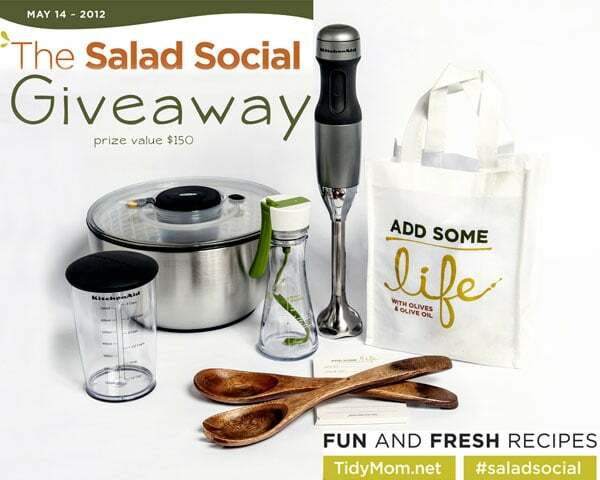 2 TidyMom readers will have the chance to win a fabulous prize pack worth $150! Ok, ready to link up? We will keep the linky open through Monday May 21, 2012. Winners will be announced the following week . All winners with a valid entry will be selected at random using random.org. Winners will be emailed and they will have 48 hours to claim their prize. Giveaways available to U.S. residents only. Thanks for participating! 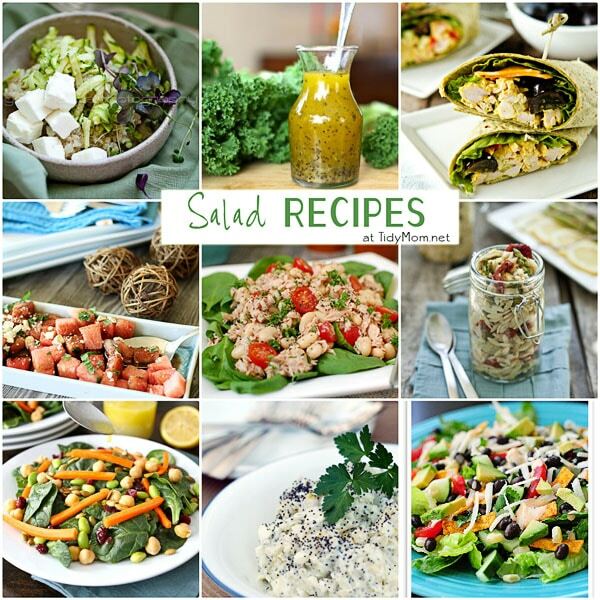 Eating salad almost every day may be one of the most healthy eating habits you can adopt! Let’s see what you’ve got! 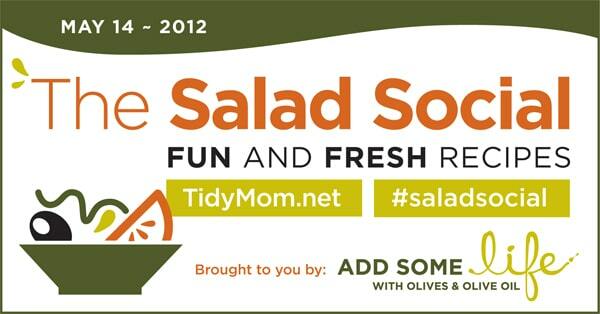 Disclaimer: Thank you to The Olive Council’s Add Some Life for providing compensation and prizes for The Salad Social. The views and opinions expressed on TidyMom are purely my own. Thanks for hosting! We linked up a ham and olive salad! Have a great weekend!! 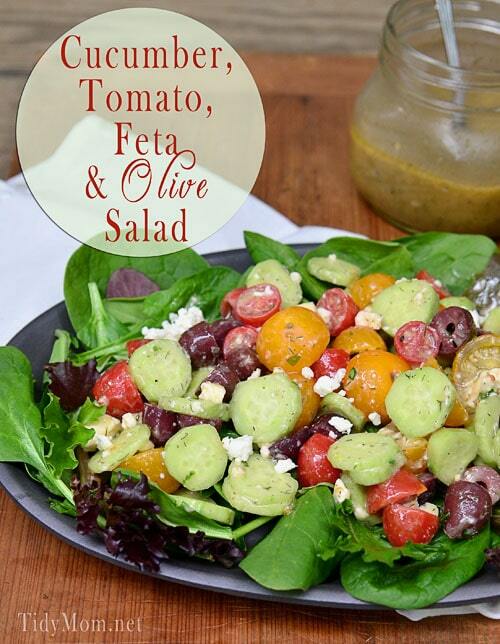 I love the combo of tomatoes, olives and feta! I linked up 🙂 Thanks for hosting!! i’ll be referring back to this all summer long! sorry i’m so late to link up! Hi Cheryl! I just linked up my Mexican Grilled Chicken Salad…it’s an oldie, but a real goodie. It makes a fabulous presentation, and I love that it can be completely prepared a few hours before serving. 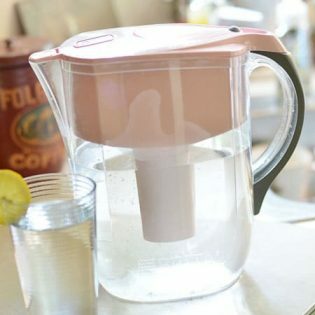 I make it several times a summer – everyone always loves it! 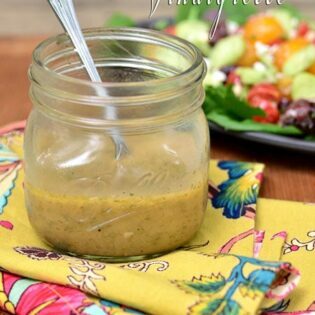 I just posted my Winter Salad with Lemon Poppyseed Dressing…Tweeted, and Pinned on Pinterest too! I have a question. I have a red x by my post above. Did I do something wrong? Also…How do you get the name of the recipe below the picture? Thanks! Just added my link. Can’t wait to sit and check out all the great ideas here! Hi! I just linked up with you for the salad social. I’ve posted & linked back on my blog. Following you on Pinterest, pinned this post, tweeted your sample tweet, posted via Instagram and posted your button in my post. Thanks for hosting! So fun!!! I just joined in! Following on Pinterest, shared on Pinterest, shared on Twitter & Instagram, used your mandatory sentence in my blog along with the button. awesome fun idea!! What a list of recipes! PHEW…just made the cutoff!! 🙂 Just added a salad to the social. I do not have a blog. I love salads. All kinds. My go to salad is lettuce (iceberg, romaine and leaf), carrots, celery, purple onions, black olives, grilled chicken and cucumbers. I use Hidden Valley Ranch Dressing (made with almond milk and organic mayo) and topped with sliced almonds. If making for my guests I add cheese. Whew–almost missed it, but just added a salad! 🙂 It’s one of our favs! Have followed you on Pinterest for a long time! 🙂 Just pinned this post! Mix in blender (or shake in closed container). Pour over salad just before serving. Thanks so much for giving me the opportunity to enter this giveaway!